Eorþupgang is lēohtbiliþ þærin sceawþ Eorþ in hiere upgang ofer Mōnan sēo wrohtede William Anders stēorrlīþman in 1968, in þæm Apollo 8 fare. Galen Rowell lēohbiliþwyhta banned þe þēos gelicnes is "seo wegendoste ymbworuldlice lēohtbiliþ ā worht." ↑ NASA audio tape encoded in MP3. ↑ Apollo 8 Command Module audio transcription. 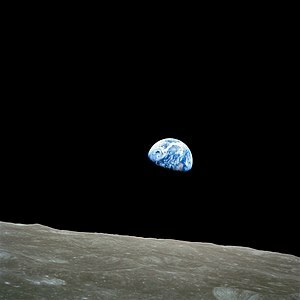 ↑ Earthrise 45th Anniversary (NASA Goddard analysis). Man nīwanost wende þisne tramet on þǣre 09:43 tīde þæs 24 Gēolmōnaþ 2015.